We recently purchased a brand new Husqvarna Lawn mower. 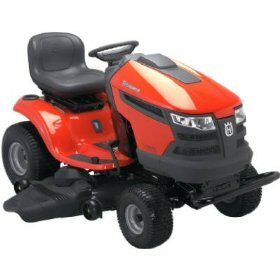 The reason we chose this model was because it has the Briggs and Stratton motor, and because the gas tank was located under the seat. The less expensive model had the cheaper motor and the gas tank sat right next to the motor and the battery was under the seat. We mow 2 1/2 acres, so the 48" mowing deck has really cut our mowing time in half. This mower has a very uniform cut. It is not zero-turn, but it is close. The deck has side mounted wheels to prevent scalping on hills. You are also able to reverse mow, which we really liked. The only thing that I had to get used to was the gas is like a car. No gears, just push on the gas and go. Takes a little getting used to. Overall, we are very pleased with our mower.